Same Technology, Low Monthly Payments. Lease A Hearing Aid For $19 To $69 Per Hearing Aid Per Month! Same technology, low monthly payments. No interest or finance charges! Road safety is about more than being able to read traffic signs, or follow the rules of the road. Being aware of your own limitations is important as well, and you need to realize that your reactions times have slowed, or that you’re not seeing or hearing as clearly as you used to. Staying safe on the road as you age means you’ll need to change a few things as you drive, and these tips for driving with hearing aids will keep you and everyone else on the road safe. If you’re driving with hearing aids, it’s important to make sure your other senses are sharp. Vision plays a crucial role in keeping you safe on the road, and seeing clearly will help you stay aware of your environment, see traffic warnings, read signs, and observe flashing emergency lights even if you don’t hear the sirens at first. Check your vision every year, and if you wear glasses or contact lenses make sure your prescription is up to date. If you’ve noticed any sudden changes in your vision, visit your optometrist as soon as possible, and look for signs of cataracts or other damage to the eyes. Do you drive a lot during the day? Make sure you have a pair of prescription sunglasses with polarized lenses so that you’ll be able to able to see the road without squinting or damaging your eyesight. As we age, reaction times slow, and even a split second can make a huge difference when it comes to road safety. You’ll need to make changes to how you drive, and leave yourself an extra second of processing time. Don’t tailgate the car in front of you, and start slowing down slightly sooner when you’re approaching a red light. Avoid very busy roads, and try not to drive during rush hour, so that you don’t need to drive when the highways are full. Look as far ahead as possible, and scan the road for any potential problems coming up. You may have noticed some physical changes in the last few years, and feel stiffer than you used to. Maybe your knees get stiff when you sit in the car, or your neck turns a bit slower. Make sure your seat is comfortable so you don’t experience pain or discomfort. You can talk to your doctor if your joints are feeling stiff, and find a solution to aches and pains. Make sure your vehicle is serviced, and that the power brakes and power steering are working well. If you’ve been having trouble turning your neck, drive with larger side and rearview mirrors to minimize your blind stop, and help you see clearly without turning your neck as often. If you’re driving with passengers, ask them to refrain from talking while you’re behind the wheel. There will be time to listen to all their stories once you arrive safely at your destination, and you can give all your attention to driving. In the same way, turn the radio off, and keep your vehicle quiet and free of distractions. Are you taking any medications? Read the labels carefully and consult with your doctor to see if any of your medications are affecting your awareness, attention span, or safety on the road. Been feeling drowsy or lightheaded? Don’t get behind the wheel unless you’re sure you can keep yourself and everyone else on the road safe. If you have hearing loss, or are driving with hearing aids, then be sure to get your hearing checked annually to make sure your hearing aids are right for you. Hearing behind the wheel is so important, and when you can hear you’ll have great spatial awareness, hear the emergency sirens rounding the corner in front of you, or the car honking in your blind spot. 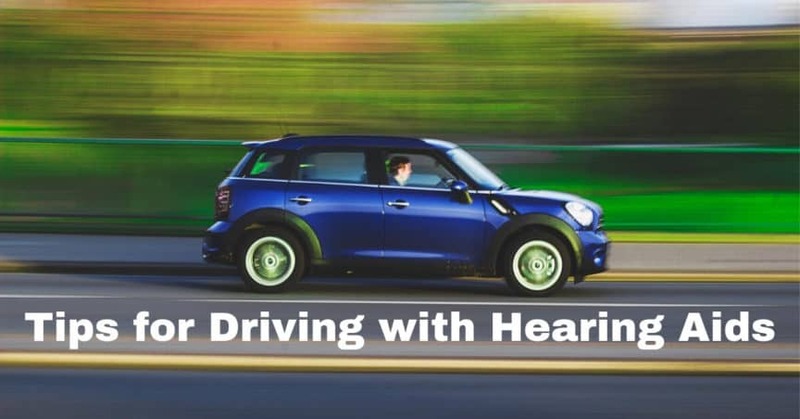 Don’t drive with hearing loss, but always wear your hearing aids. Call us today at Ear-Tonics to make sure your hearing aids are helping you hear. We have more tips about road safety, and we’ll help you stay on the road, be independent, and enjoy life to the fullest. Lease Your Hearing Aid for $19 to $69 per hearing aid per month. Copyright © Ear-Tronics. All rights reserved.